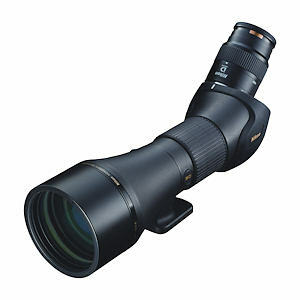 Nikon Monarch 20-60x82 ED Angled Fieldscopes bring innovation and high-end features to mid-priced scopes. Enhancing the Nikon ED glass and full multi-coatings are eyepieces with Field Flattener Lenses and Total Reflection Prisms. The helical focus collar provides variable speed focusing: fast speed for near subjects, fine focusing at long distance, and medium speed at middle distances. The 82mm models can focus on subjects as near as 16.4' with the included 20-60x zoom eyepiece or either of the two optional lenses. Digiscoping adapters are available that fit some Nikon point-and-shoot and SLR cameras. Field of View: 111-51 ft. at 1000 yds. Product Weight (oz): 57.8 oz. Dimensions: 13.1 x 4.4 x 4.3 in.